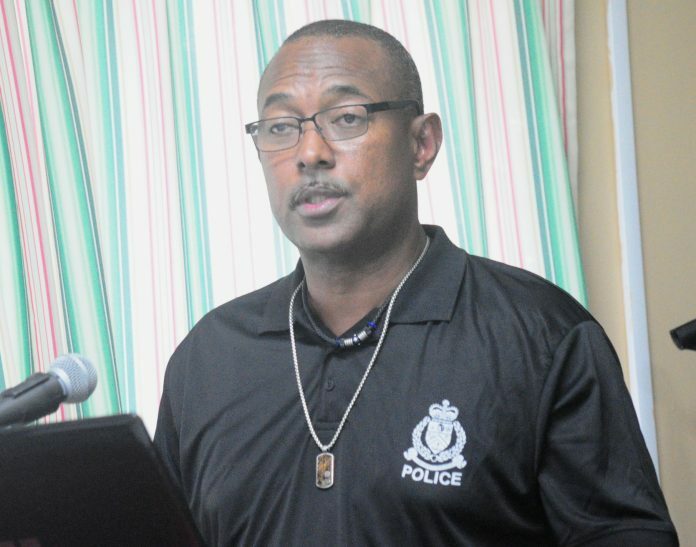 BASSETERRE, St. Kitts — Commissioner of Police Ian Queeley is promising stern action in apprehending the killers of Sargent Leon Powell, who was killed in the early hours of Saturday morning in his private business place in Newton Ground. In a press briefing Saturday, Queeley said, the death of Powell drew mixed emotions from him and the men and women of the Royal St. Christopher and Nevis Police Force (RSCNPF). The commissioner added that Sergeant Powell would have given more than half of his life in service to this Federation, to ensure a safe and secure environment for all to enjoy. “As a result the incident, an emergency meeting was held with Senior Officers of the force to brief them on the progress of the investigation so far,” Queeley said. He then promised swift justice for the perpetrators of the act. “These cowards for their own selfish gain and greed have senselessly cut him down in the prime of his life, by brutally killing him. I say openly to the perpetrators of this most heinous crime, that you will find no comfort,” Queeley said. He labelled attacks against the police force and crime in general as unacceptable. “The men and women who have taken the oath to serve this country and knowingly put their lives on the line every day to protect others are held in the highest regard. I have said it before and I will say it again. No acts of violence against them will be tolerated. Queeley noted that they hope to have the matter solved as swiftly as was done with Sergeant Dwight Davis. “As we saw in the Sergeant Davis case, the public’s assistance in solving these matters goes a long way,” the commissioner said. “This matter was resolved speedily and the perpetrator is now before the court awaiting his fate. “It is important to underscore the critical role of the public to solving criminal cases. I am urging you to come forward with every bit of information no matter how little or insignificant it may seem. “Tell us whatever you know. It is also important to stress that the public must also condemn this kind of criminal activity loudly and openly in every forum and not just when it’s convenient to do so. Assistant Commissioner of Police Andre Mitchell gave the press a rundown of how the incident unfolded. He said the incident took place at the business premises of Powell. Mitchell said the motionless body of Sergeant Powell was found at his premises by the responding officers. The Assistant Commissioner of Police said preliminary investigations revealed that two armed masked men entered the business place, robbed the patrons and then proceeded to rob the sergeant. “Our deceased colleague resisted and was shot multiple times. “The scene was processed and a number of exhibits were taken for forensic and evidential value,” Mitchell said. He added that to date four persons are currently in police custody and one shotgun recovered. No one has yet been charged and it is unsure if the gun was involved in the incident. “We are seeking the public’s assistance for whatever information that may lead to an arrest of the perpetrators,” Mitchell said. On Saturday, police also issued a wanted poster for a Vincent Taylor who is a “person of interest” in the matter.